Diana, Princess of Wales: A Biography: A Biography was written by Martin Gitlin. 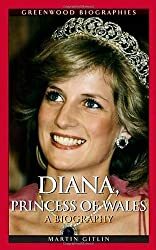 Diana, Princess of Wales: A Biography: A Biography was published by Greenwood Publishing Group. Subjects of Diana, Princess of Wales: A Biography: A Biography include Biography & Autobiography, Biography/Autobiography, Royalty, and Women.